NEA Baptist Breast Imaging Center receives funding from the Susan G Komen Foundation. These funds provide free screenings and diagnostic mammograms, as well as, breast ultrasound services to women who are uninsured or underinsured. Travel funds are also available for those that live in neighboring counties but do not have the means for travel to the NEA Baptist campus in Jonesboro. 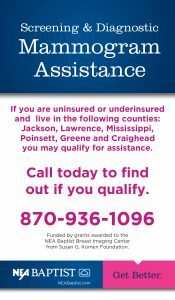 If you live within the following counties: Craighead, Greene, Jackson, Lawrence, Mississippi, and Poinsett contact Stephanie Patterson at 870-936-1096 to see if you qualify for screening , diagnostic and mammogram assistance today. Early detection is the best defense against breast cancer. Research has proven that success of treatment and survival rates for breast cancer patients are dramatically affected by early detection. NEA Baptist Breast Imaging Center offers 3D Mammography that detects 41% more invasive breast cancers and reduces false positives by up to 40%. NEA Baptist Breast Imaging Center is located at 4800 E. Johnson Ave. in Jonesboro. For more information about walk-in availability or general appointment scheduling please call 870-936-PINK.